Remember how we all used to watch the Behind the Music documentaries? There’s something fascinating about learning what happened behind the polished result. Well consider this a blog version, where we go behind the scenes of a liqueur. My good friend Kelly, decided she wanted to make limoncello and give it away as gifts for Christmas. Fortunately for her, she decided this about three months before Christmas because that’s how long it took to infuse lemon zest into alcohol. After a lot of work and even more time, Kelly filtered and bottled half of the batch and was ready for the holidays. With so many steps and so much planning going into these homemade gifts, I couldn’t resist making a chart of the process. Each bottle had 312 hours in it. That’s almost an hour per ounce. And in case your BS radar is going off, yes only half the batch was filtered and bottled, so assuming it takes another eight hours to filter the rest, and another hour to bottle, that would bring down the average per bottle to 157 hours. That’s still a lot of time! In addition to helping Kelly make her limoncello by scrubbing the lemons and filtering the rum through my Brita, I gave it a name and designed the labels. The name Four Goldens Limoncello came from the fact that Kelly has four golden retrievers—Gatsby, whose favorite toy is a green bone; Mike, the laid back chow mix; Maddie, the happiest girl in the world; and then there’s Lawrence, he sort of defies explanation. I made four little lemon-head dog cartoons, each one representing one of the goldens. Gatsby has his trademark green bone. Below are three label ideas at an early stage. I showed these to Kelly and she picked the one she liked the most. She saw right away that her dogs were on the label. It made her happy, which made me happy. Now for a little behind-the-scenes of the behind-the-scenes. As you see, I have a very fancy photo studio, and a highly-trained assistant…I know it looks like a piece of poster board and kitty cat. When you spend 40 hours a week at a computer, you long for some hands on activities, and sometimes a good old fashioned craft project is just what the doctor ordered. Last year I found two unpainted wooden toys at the store and decided to turn them into Christmas ornaments for my two nephews. I knew at 2 and 4 years old they wouldn’t appreciate them yet, but one day they would. I felt like one of Santa’s elves as I sanded out all the rough spots on a wooden train and a wooden propeller plane, and then lovingly painted each one and put their initials on them. About a month ago my niece was born. What do you get for a month old baby who already has everything? It was perfect timing to make another ornament and continue the tradition. There are three of them now, that makes it a tradition, right? I found a cute little wooden bird cutout with a wing detail at the craft store. It came pre-printed with some details on it, coloring book style, but after I primed it with gesso, they were all covered up. I winged it, no pun intended. (Okay, it was intended.) Each side is slightly different, with a lot of dots. I busted out some toothpicks for those. Doesn’t get much more arts and craftsy than that. Just a simple and sweet little project. What do you do when a project you worked made you smile while working on it? I think you should find a reason to work with those things again. I couldn’t help smiling while drawing some cute dinosaurs for a project. But by the time the project was all done, not all of these party-goers were needed. I didn’t want them to feel sad since they didn’t get invited to that party, so I gave them a reason for existing–wallpapers! Party all day long with my dinosaurs, just download them from the newly created Downloads page and put them on your computer desktop, your iPhone, even your iPad. Here at the credit union we just launched an internal site for employees. It’s called the Hub. Hopefully it will be the first place employees will go to find office forms, see photos from company events, learn about company news and find lots more things—sorta be at the center of things…get it? To promote the launch of this site, we used a guerrilla marketing technique to create buzz. For three days leading up to the launch we posted tons of flyers in the shared areas of our office suites. There was a different design for each day. At night we took down the old one and put up the new one, so each morning employees were greeted with a different humorous, and somewhat vague, message about the Hub. Without going into details, it sure did create buzz! People wanted to know what the Hub was. I think my favorite is one with an employee’s photograph that had been censored; black bar over the eyes type of censorship, though it was still clear who the person was, with a graphic of a koala hanging on the side of the photo. The copy teased that you could find out who secretly wants a koala as a pet by reading the employee spotlight on the Hub. Just fun stuff there. On the morning the site launched, employees came into work and found a black mug with M&Ms waiting for them on their desks, and an email in their inbox letting them know the Hub was alive! Everyone seems pretty pleased with their mugs of candy. I’m calling this launch a success. The Carolina Rollergirls took a few weeks off from practices, meetings and games. It was awesome. Breaks are a very important part of training. Tomorrow night we are starting up again and I’ll be glad to get back into the swing of things. I feel I really took advantage of the break. I tried two new exercise classes. I attended a design conference in Chicago. While in Chicago I tried a deep dish pizza, a Chicago style hot dog and had grapefruit sorbetto that was transcendent. I took an architectural boat tour, saw the aftermath of the pride parade, took in the views from the Hancock Signature Lounge and attended many inspiring conference sessions. While at the conference, I started sketching. Sometimes I really enjoy digging into a somewhat detailed pencil sketch. I challenged myself by using only a cheap mechanical pencil. It was much more feasible to travel with that than a set of wooden pencils that might break or would need to be sharpened. I like things that are a little bit off. I love learning about strange medical conditions or things like body farms. Visiting the Mütter Museum was something I felt compelled to do once I learned of its existence. 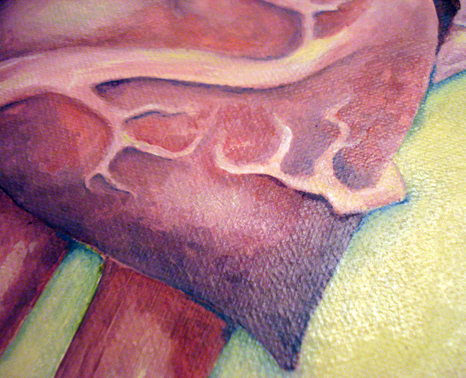 With my pseudo-anatomical heart I was trying to go for the grotesque. The heart, as a symbol, is everywhere in our culture. Girls draw it on notebook paper. It’s on playing cards. New Yorkers (and tourists) use it to replace the word love on t-shirts. And in our culture the heart in our chest is also associated with love. I wonder how often we picture that Valentine-shaped object in our ribcages, beating away, instead of the wonderful muscular organ who actually resides there. After I completed my sketch, I knew I wanted to turn it into an oil painting. I had gotten tired of sighing and admitting to people that it had been years since I’d done a fine art project. I needed to prove to myself that I could. And once I started, it was wonderful. I took photos of my progress, starting with some basic color blocking, progressing to more and more detail, an experiment with darkening the corners and then undoing that, and finally something I think I am finished with. 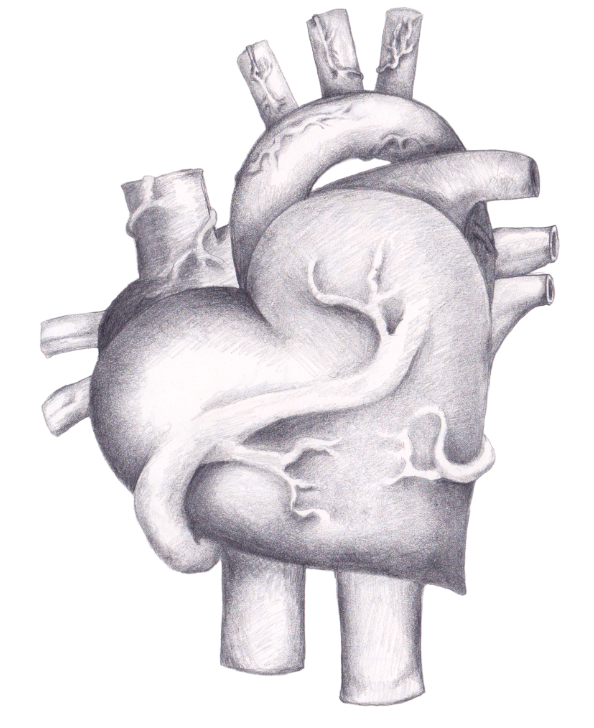 Since animated gifs are fun, please enjoy the way this heart wiggles around and changes color. The color changes are mainly from the varying lighting conditions going on while taking the photos. Using my point-and-shot to take a photo of it on my kitchen table really doesn’t do it justice, but I figured it was better than trying to scan my still-wet painting. That wouldn’t end well on many levels. I’m pleased with the result, but I think I might try painting this image/concept again. I still have much to learn from this form. Also, it could be grosser. I have a hard time sketching in a sketch book. The formality of those bound pages dedicated to collecting my sketches is a little intimidating. But I love to doodle and usually have the most success on scraps of paper. Now why I was thinking about giant winter hats on a mild summery day, I’m not sure. After scanning the image, I added some quick flat color. Clearly there is something on her mind, but she’s still cute. Designing logos is one of my favorite things to do. It’s the type of project I can really sink my teeth into. I can put on my headphones and listen to my 12-hour long playlist and just sit there for hours at a time exploring…in an ideal world. In the real world we have clients. Last year, at the company where I work, we took on a client who wanted to redo their logo. After many rounds of explorations with three designers working on options, they realized it was smarter for their business not to change their logo. That’s how it is sometimes. But that doesn’t mean the work you did on it wasn’t good work. So after sitting in a long-forgotten computer folder, I thought I’d dust off a few and put them out there for the world to see. The client has a close tie to North Carolina (it’s even a part of their name) and requested a flag be involved. I’ll admit the prospect of incorporating a flag into a logo was sort of scary for me. A flag is a symbol unto itself and carries a lot of meaning. North Carolina’s flag has a lot of detail, unlike the flag of Texas or Japan, so stylizing it was a challenge. 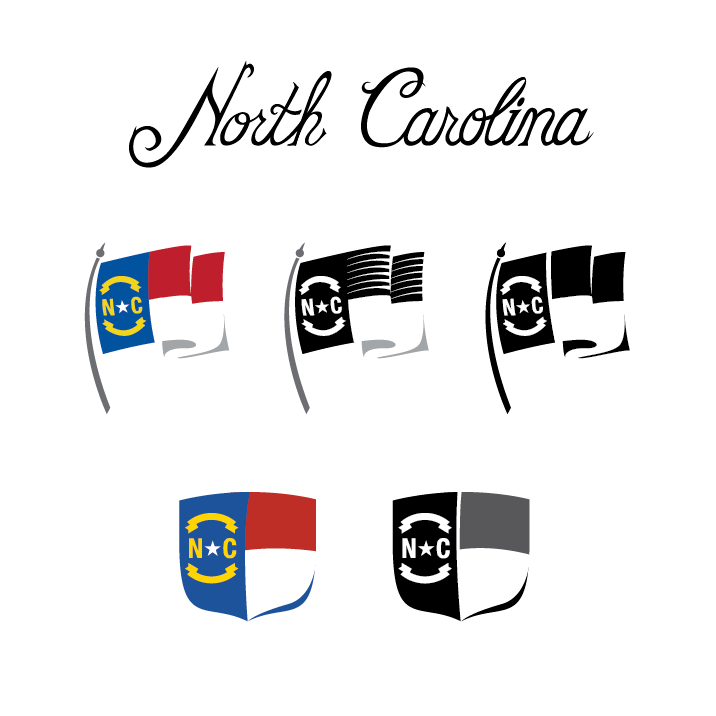 I also worked up a hand-drawn calligraphic treatment for the words North Carolina, in an attempt to give it a little historical feel. There are many more ideas that I worked on, but here are just a few elements. I’ve been getting a lot of spammers trying to comment on my blog. I moderate all the comments, so none of these have made it through. However, some of them are pretty great and can be quite the ego boost…you know, if you pretend they are real and not just some robot stringing words together. Here’s a sampling, a greatest hits if you will. nice blog, like the simple theme for this site. nice job! Maintain the excellent work mate. This web blog publish shows how well you comprehend and know the subject. I wish to show appreciation to this writer for bailing me out of this predicament. Because of scouting through the search engines and obtaining concepts which are not helpful, I figured my entire life was over. Existing without the solutions to the issues you’ve sorted out by way of this short post is a serious case, and the ones that might have badly affected my career if I had not encountered your web blog. Your own personal talents and kindness in controlling all the details was excellent. I’m not sure what I would’ve done if I hadn’t come across such a step like this. It’s possible to now look forward to my future. Thanks a lot very much for the specialized and amazing guide. I won’t think twice to propose your blog post to anyone who should get recommendations on this subject. What i don’t understood is if truth be told how you are not really a lot more well-appreciated than you may be now. You’re so intelligent. You already know thus significantly in the case of this matter, produced me personally consider it from numerous numerous angles. Its like women and men aren’t involved except it is one thing to do with Woman gaga! Your personal stuffs outstanding. At all times care for it up! Yes, how is it I am not more appreciated? Indeed! I’m probably one of the most dynamic thinkers of our time. I’m like a Woman gaga over here! I will care for it up, at all times. One of the intoxicating aspects of creativity is the art of collaboration. A couple of weeks ago my friend Kelly told me she and her friend Kat were going to start a 365 photography project and post their photos on a shared blog, Two Eclipse Seasons. Each photographer has a focus, but they share a weekly theme. At the time, I didn’t necessarily think I’d be getting involved. But I’ve helped with several of Kelly’s photo shoots. Sometimes I’m just pushing the shutter button, discussing ideas or other times, getting really involved. It’s been a fun project, and there are about 351 days to go. After helping out with a few things I realized, hey this is collaboration at it’s best; friends helping each other, creating something bigger and better than an individual would. When they decided on a WordPress theme that had two areas for logos, I just couldn’t let my friends have a blog with placeholder images. So I whipped up a couple of images for them. Simple stuff: the title image and the double K image. That double K image reminds me of the moon and it’s a subtle little tribute to the blog’s authors. I also created a “take the poll” image that can be updated and used when a post doesn’t have a photograph associated with it. In all the items, I didn’t want them to be distracting from the main point of the site; the photographs. I matched the colors to the theme and kept the typography light and clean. The authors are very happy with it, and so am I!